We'll go out on a limb and say that Vanessa Selbst is on the verge of becoming the first woman to win the same major event in back-to-back years. 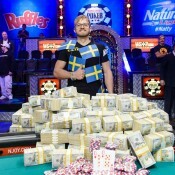 The 2011 NAPT Mohegan Sun got two made-for-TV final tables that should make ESPN happy. 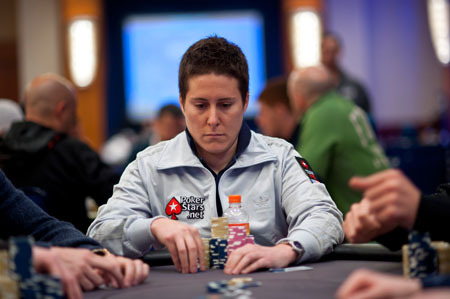 In the Main Event, Vanessa Selbst, a woman who likes women, is in second overall as she goes for her second consecutive title. Selbst is stacked at 2,249,000. She only trails Tyler Kenney with 3,021,000. Also making a final table run are Dan “Beth sure seems to be enjoying my half” Shak (1,571,000), Joe Tehan, whose name still looks too much like Tehran for our liking (1,238,000), and Steve O’Dwyer (1,032,000). 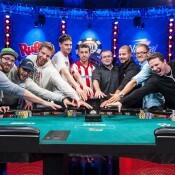 Get full chip counts and follow the final table action here. In the $10,000 High Roller Bounty Shootout, Jason Mercier, who is kind of like a young Erik Seidel in these types of events, made the fiver-person final table. This final table will take place on Thursday. Get full chip counts here.